CRIS Recruitment 2017 -In 1982, Indian Railways (IR) set up a central organisation (COFOIS) to computerise freight operations. In 1986 the Ministry of Railways saw the need for a dedicated, autonomous organisation and established CRIS, an umbrella organisation for all information technology-related activities on Indian Railways. It was entrusted with the task of designing, developing and implementing the Freight Operations Information System (FOIS) and its communications infrastructure. CRIS began functioning in July 1986 as an autonomous organisation headed by an Executive Director (later redesignated Managing Director). A unique feature of CRIS is collaboration by IT specialists and railway experts on deputation from the Indian Railways. Systems managed by CRIS have received international recognition from Computerworld. Apply online for 54 JSE and JNE – Centre for Railway Information Systems has recently released a recruitment notification to fill 54 Vacancies of Junior Software Engineer (JSE) and Junior Network Engineer (JNE). Interested eligible candidates who are looking jobs in CRIS may apply online from www.cris.org.in before 08-02-2017. 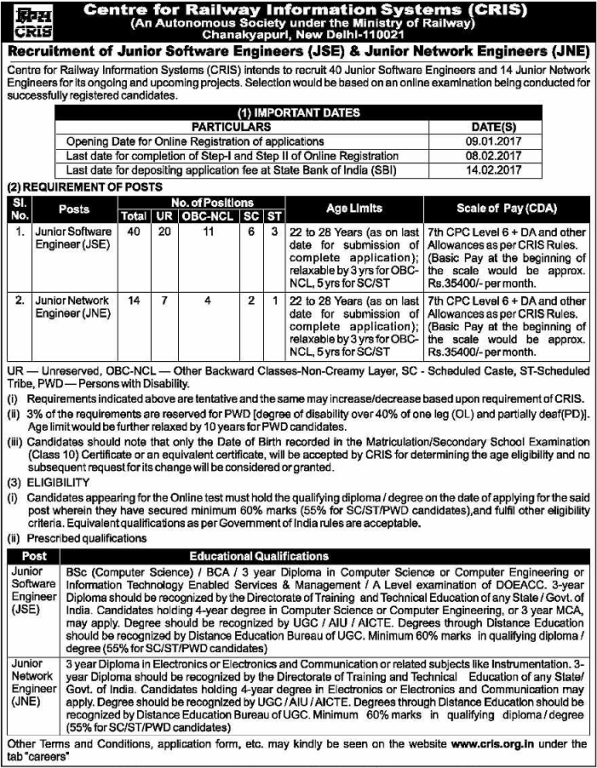 Educational Qualification: CRIS selection board looking candidates who have Diploma in computer Science or BE/B.Tech in CS or IT or Management / Electronics and communication or BCA/MCA or other equivalent qualification. How to Apply: JSE and JNE Applications by CRIS invite online between 09-01-2017 to 08-02-2017 from its official website www.cris.org.in online application link will be activate on 09-01-2017.